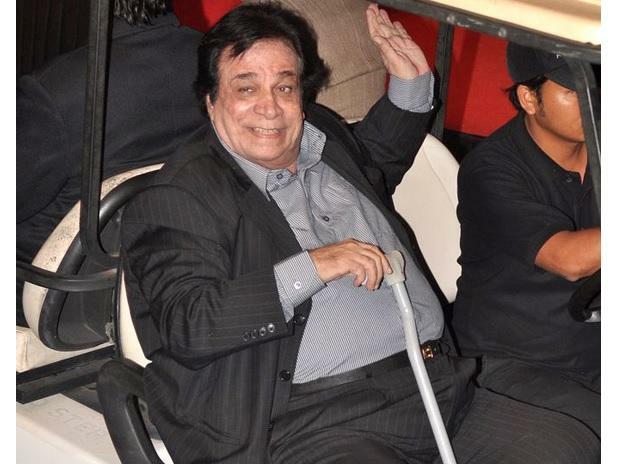 Kader Khan, the rare Bollywood artiste who straddled the twin worlds of writing and acting with equal prowess, died in Toronto after prolonged illness on the last day of the year, his son said. He was 81. Khan, who left an indelible imprint on commercial cinema of the 1980s and 1990s, slipped into a coma on Monday in a Toronto hospital. He is survived by his sons Sarfaraz and Shahnawaz. “My dad has left us. He passed away on December 31 at 6 pm as per Canadian time due to prolonged illness. He slipped into coma in the afternoon. He was in the hospital for 16-17 weeks,” Sarfaraz told PTI. The last rites of the veteran actor, who was a civil engineering professor before going on to act in more than 300 films and writing over 250, will be held in Canada. “We have our entire family here and we live here so we are doing it. We are thankful to everyone for their blessings and prayers,” he said. News of the death of the actor-screenwriter, known for writing blockbuster hits such as Amar Akbar Anthony and Coolie No 1 as much as for his many character roles, came a day after his son dismissed media reports of his demise. According to reports, he was suffering from progressive supranuclear palsy, a degenerative disease that causes loss of balance, difficulty in walking and dementia. President Ram Nath Kovind and Prime Minister Narendra Modi condoled Khan’s death. "His versatility, from comic to negative roles, and the films he embellished as a writer are still remembered. Condolences to his family, friends and fans," the President's official Twitter handle tweeted. The prime minister remembered Khan for his unique sense of humour. "Kader Khan ji brightened the screen with his stupendous acting skills and lightened it thanks to his unique sense of humour. He was also a prolific screenwriter, associated with many memorable films. Saddened by his demise. Condolences to his family and admirers," Modi tweeted. Back home in Mumbai, his colleagues and well-wishers from the Hindi film industry expressed their profound grief at the death of the Kabul-born Khan. Khan played a key role in shaping Amitabh Bachchan's career, writing some of his career defining films like "Muqaddar ka Sikandar" and "Coolie" and acting along side him in many others. "Sad depressing news. My prayers and condolences. A brilliant stage artist a most compassionate and accomplished talent on film. "A writer of eminence; in most of my very successful films. A delightful company and a mathematician," the actor wrote. Khan's other frequent collaborator Govinda, for whom he wrote "Shola aur Shabnam" and "Coolie No 1", described him as a father figure. Khan played his father in "Hero No 1". "He was not just my 'ustaad' but a father figure to me, his Midas touch and his aura made every actor he worked with a superstar. The entire film industry and my family deeply mourns this loss and we cannot express the sorrow in words," Govinda said. Khan made his writing debut in 1972 with the Jaya Bhaduri-Randhir Kapoor starrer "Jawani Diwani" and his acting debut the following year with Rajesh Khanna's "Daag". His films with Desai include "Dharam Veer", "Desh Premee", "Suhaag" and "Parvarish", and films with Mehra include "Sharaabi" and "Lawaaris". Bollywood celebrities from across generations recalled the genius of the man. Rishi Kapoor remembered him as a great teacher.